Whiskey has been around for centuries and is an integral part of many cultures in the world. But not many people know how this burnt, amber liquid came about. The word derives from the Gaelic word for water, uisce. The full term is uisce-beatha, or "water of life". The French have a similar term, eau de vie, which has a broader connotation of more than just whiskey. Whiskey must have been pretty important to have its name derived from such a basic necessity. Distillation goes back to the first millennium A.D., but whiskey only came about in the Middle Ages. It was probably invented in Ireland or Scotland sometime in the 15th century. Whiskey is distilled from a beer (or mash) made from barley, corn, wheat, and/or rye. In the case of barley, the seeds can be soaked for a few days which cause them to germinate. The germination is then halted by applying dry heat in a kiln (fired with peat for Scotch or Japanese whiskey). This process causes enzymes to break down the grain's starch into simpler sugars and is called malting. Rye is also sometimes malted while corn and wheat are not malted. The mash can be distilled once or several times resulting in a clear whiskey that is between 65 and 80% alcohol. This clear product is then aged in oak barrels that are charred by fire on the inside. The aging can last anywhere from 2 years to decades. 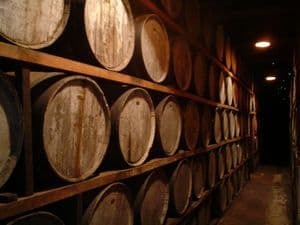 Cheap bourbon can age 2 to 4 years, quality whiskies and Scotches sit for 6 to 18 years, and top of the line stuff can soak in the charred oak for 20 to 30 years or more. After emerging from more than a decade on oak, some Scotches are finished in old sherry, port, or Madeira barrels for several months. This "finishes" the Scotch whisky with some character from the wine that used to be in the barrels. American whiskey Includes bourbon, rye, corn, and Tennessee whiskey. If aged for two years or more, the whiskey is designated as "straight". "Blended" whiskies are straight whiskies combined with neutral spirits, unaged whiskey, and/or flavorings. Scotch whisky Aged a minimum of three years, distilled two or three time, and made from a single or a blend of barley and/or malted barley. The barley is smoked with varying amounts of peat smoke which imparts a smoky, musty flavor and aroma to the Scotch. Irish whisky Usually distilled three times and aged a minimum of three years, though often the aging is much longer. Peat is rarely used, and barley is the predominant grain (malted and unmalted). Canadian whisky Produced from a mash of grain and aged for a minimum of three years in small wooden barrels. Malted rye is often used in the mash which results in a fuller bodied whiskey. Japanese whisky Similar to Scotch whiskey, Japanese whiskies use malted barley in the mash, but not as much peat as the Scottish distilleries do. There are quite a few single malts, but there are also some blends. The different styles of whiskey impart very different aromas and flavors to the taster. Bourbon usually has some vanilla notes that come from the oak. You can sometimes almost taste the char in older bourbons. Tennessee whiskey is charcoal filtered, so it smoothes out and refines the more rustic nature of bourbon. You may favor the rambling nature of bourbon or the more homogenized nature of Tennessee whiskey. I like them both. If you want to stick your toe in the deep end, try a rye whiskey. Old Overholt is a solid four-year whiskey with substantial rye body. Jim Beam (the yellow label), and Wild Turkey also make rye whiskies. Try rye whiskey in a Manhattan--the rye flavor complements the sweetness in the vermouth quite nicely. Scotch can run the gamut from light single malts with faint peat notes like Glenlivet to more robust blends like Dewar's and Johnnie Walker. Then you get into single malts with fruity, flowery character that have been finished in sherry casks, to iodine and peat-laced malts like Lagavulin. At the fuller end of the spectrum there are the single malts made by the sea that have medicinal, salty notes and massive amount of peat such as Laphroaig. There is great variety in Scotch, and it can be quite a lot of fun discovering new malts that are quite different than what you're used to. This happened to me when I was pleasantly surprised with Laphroaig Quarter Cask. In the United States, Irish whiskey usually means Jameson and Bushmills. These are light bodied whiskies that have some green (unmalted) grain character. They are quite good, and can be found in older and more complex versions. If you want to break out of the ruling duo, try Redbreast, a 12 year pure pot still whiskey. It is usually available in a good Irish bar. Or if you want to try a top flight Irish whiskey, Midleton Very Rare is quite good (and quite expensive). For Canadian whiskey, you pretty much have Crown Royal and not much else (unless you're in Canada). Crown is pretty good stuff, though it's not as spicy, smoky, and fragrant as some American bourbons that I like. Canadian whiskey is usually lighter and softer than other whiskies. The two different spellings of the word--one with an "e" and one without--came about in the 1870's when Scottish distilleries were flooding the market with an inferior product. Back then, whiskey was spelled without the "e" everywhere. In order to differentiate themselves from the poor Scottish product, American and Irish distilleries started using an "e" when spelling whiskey on their labels. This continues to this day, though the quality of Scotch has improved greatly. A few American distilleries such as George Dickel and Maker's Mark don't use the "e" due to their Scottish roots.